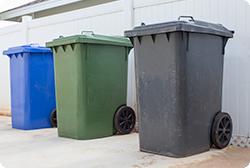 Don’t let unsightly trash cans and overflowing ashtrays drive your customers away. Keep your store free of litter when employees are trained to monitor trash cans and ashtrays regularly. This computer based training module provides the steps for keeping receptacles clean, disposing of trash bags properly, and the most efficient way to empty and clean ashtrays. Employees learn to keep your establishment appealing to encourage repeat business.